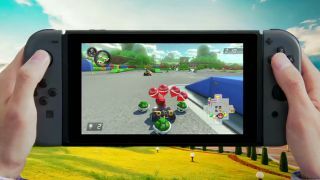 The Nintendo Switch has us mostly brimming with excitement, but one of the more worrying aspects of its announcement was the reveal of a paid subscription for multiplayer functionality. While some fans are reasonably wary of Nintendo's new service, given the company's historically leery-eyed view of the internet, it thankfully appears that the online subscription may not break the bank of those who make the Switch. Nintendo's upcoming online service likely cost users only 2,000-3,000 yen annually, or about $18-$24/£14-£19/AU$24-$AU32 according to The Nikkei. Though the Nintendo Wii U and 3DS have been able to do online for free, Nintendo President Tatsumi Kimishima comments in the report that, "with paid [services], we will be able to fully commit to customers." By contrast, competing premium online services like Xbox Live Gold and PlayStation Network Plus cost $60/£40 (about AU$80) a year, showing a significant discount on Nintendo's part compared to Microsoft and Sony's fees. That said, Xbox Live and PSN does offer its premium subscribers various substantial perks such as discounts on their respective storefronts and free games every month. Though we don't know the whole story behind Nintendo's proposed online service, we know it will allow discounts on select games and a free classic NES or SNES game each month...that can only be played that month before going away. The Switch's crack at paid online functionality may not offer much compared to the likes of Xbox and PlayStation, but the significantly lower annual fee could help take the sting out for those itching to play Splatoon 2 over the 'net. Those still not sold on the service can also try it free when the Nintendo Switch launches in March, as Nintendo doesn't plan on formally launching the subscription model until later this fall.